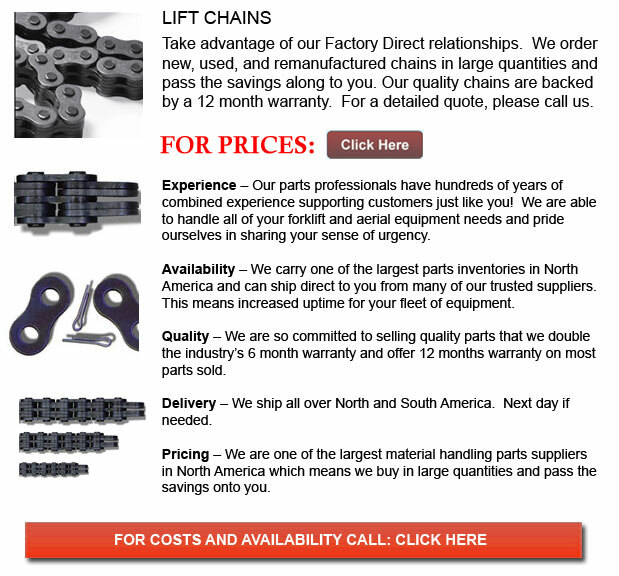 Forklift Chain - The life of lift chains on forklifts could be extended completely with proper care and maintenance. Like for example, right lubrication is actually the most efficient technique to be able to extend the service capability of this part. It is really important to apply oil every so often utilizing a brush or other lube application device. The frequency and volume of oil application must be sufficient so as to stop whichever rust discoloration of oil within the joints. This reddish brown discoloration usually signals that the lift chains have not been correctly lubricated. If this situation has happened, it is extremely imperative to lubricate the lift chains right away. It is normal for several metal to metal contact to happen all through lift chain operation. This could result in parts to wear out in the long run. The industry standard considers a lift chain to be worn out if 3 percent elongation has happened. So as to prevent the scary chance of a disastrous lift chain failure from happening, the manufacturer greatly recommends that the lift chain be replaced before it reaches three percent elongation. The lift chain lengthens because of progressive joint wear that elongates the chain pitch. This elongation could be measured by placing a certain number of pitches under tension. So as to ensure good lift chain maintenance, another factor to consider is to check the clevis pins on the lift chain for indications of wearing. Lift chains are put together so that the clevis pins have their tapered faces lined up with each other. Usually, rotation of the clevis pins is frequently caused by shock loading. Shock loading takes place if the chain is loose and then all of a sudden a load is applied. This causes the chain to experience a shock as it 'snaps' under the load tension. With no correct lubrication, in this particular case, the pins could rotate in the chain's link. If this particular situation occurs, the lift chains must be replaced immediately. It is essential to always replace the lift chains in pairs in order to ensure even wear.